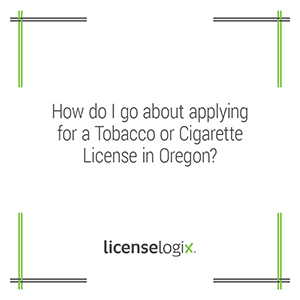 How to apply for a Tobacco or Cigarette License in Oregon? Step 1: Select your business name and structure. Are you a sole proprietorship, general partnership, corporation, limited liability company, limited liability partnership, or limited partnership? If you have not established what type of legal structure your business entity is, LicenseLogix can help you get started with your new business formation. Step 2: Register with the Secretary of State. If you are already have an established business entity in a state other than Oregon, you must register with the Oregon Secretary of State's office. LicenseLogix can help you register to do business with the Secretary of State. Step 3: Apply for your Federal Tax ID Number. All businesses, except certain sole proprietors, are required to have a Federal Tax Identification Number. Step 4: Determine which type of tobacco license you need. There are three kinds of licenses. Cigarette Distributor License: For persons who bring untaxed cigarettes into Oregon for resale. The Cigarette Distributor License allows you to purchase the necessary Oregon tax stamps from the Department of Revenue that you must affix to each pack of cigarettes before you can sell them in Oregon. Cigarette Wholesale License: For persons who buy from licensed distributors cigarettes with affixed Oregon tax stamps to each pack. Wholesalers can then resell these cigarettes to other retailers. Tobacco Products Distributor's License: For persons who bring untaxed tobacco products other than cigarettes (known as other tobacco products or OTP) into Oregon for resale. OTP includes blunt wraps, shisha, cigars, chew, roll-your-own, loose-leaf tobacco, and more. If you have questions about which type of license you need, you can contact a licensing expert through our live support function or by calling (800) 292-0909. Step 5: Identify the distributors and/or wholesalers from which you intend to purchase your cigarette and/or tobacco. On the distributor/wholesale application form, you will be required to list the names, addresses, and contact information of all your suppliers and/or manufacturers from which you purchase tobacco. The application cannot be processed unless this information is provided. Step 6: Fill out an Application for Distributor/Wholesale License and submit it: LicenseLogix can help you to prepare your application, submit it and follow up with the State to ensure compliance with the States regulations.